E.B. White, in his classic Charlotte’s Web, had the famous spider write adjectives in her web describing the beloved pig. The words Some Pig, Terrific, Radiant and Humble saved Wilbur’s life. I wish E. B. White was still alive so he could meet my pet Canada goose, Gertie. She is some goose or, uh, some gander. I think of Gertie as female, but I could be wrong. Male geese are friendlier than females, and they don’t come any friendlier than Gertie. 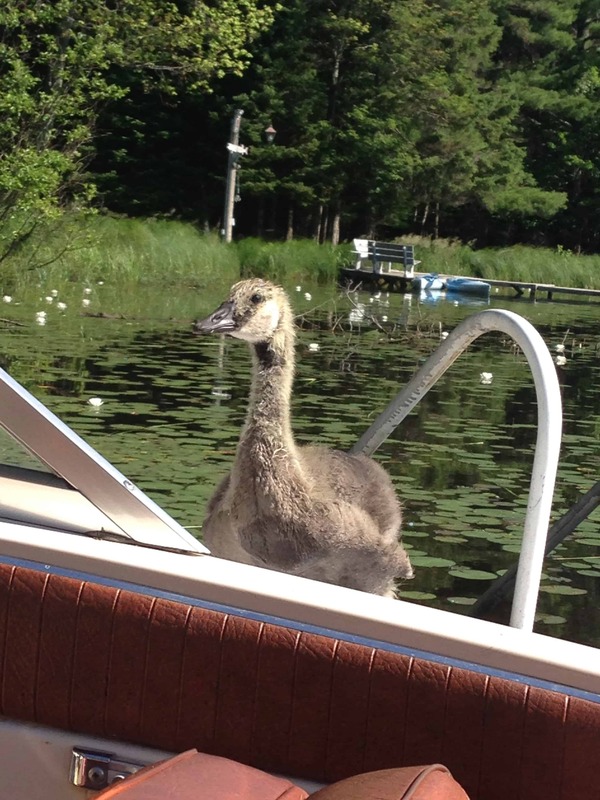 Goslings grow at an extraordinary rate, and she was soon big enough to explore our cabin’s shoreline looking for tasty bugs and enjoy the water. Gertie loves it when we swim with her. One day she showed off her skills by zipping on top of the water like a loon will do before takeoff and dunking. She even did a complete underwater roll. Afterward she looked at us expectantly and we clapped. She immediately rolled a second time. If E.B. White would have seen, he’d say, Some terrific goose. We sped off. I never thought to look, but she had followed. Our granddaughter, Maria, happened to see her. Gertie hadn’t swum far from shore before, but she did now. Maria quickly grabbed a favorite treat, watermelon, and jumped in the kayak to paddle after Gertie and the ducks. So now we had Gertie following Frank and I, the ducks following Gertie, and Maria following the runaways. Gertie spotted a young woman on a standup paddle board in the middle of the lake and forgot about finding us. She flapped her wings and zeroed in on the young woman. The woman had never seen Gertie and the ducks. She thought Gertie might be the parent. When Gertie excitedly skidded to a stop sending a small rooster tail of spray onto the woman’s legs, she panicked. Gertie opened her mouth, revealing her tongue, and honked. The woman frantically paddled for the safety of her cabin. But Gertie and the ducks followed, stalking the woman and joining her and her friends on shore. About this time we boated back and spotted our granddaughter hurriedly paddling toward a cabin across the lake. We noticed Gertie and the ducks, tails wiggling and wings flapping, entertaining their new friends. We joined our radiant pets, to borrow a word from Charlotte’s Web, and made some new friends ourselves. Continue reading Gertie and Doc, the TeenageYears http://laundrie.com/gertie-and-doc-the-teenage-years for the tale of the rebellious teenagers who decide to run away and explore the world.